Since the onset of the AIDS pandemic more than three decades ago, researchers and physicians have been working toward the goal of an AIDS-free world. Last week, a conference hosted by the journals Cell and The Lancet brought leading researchers and clinicians together to discuss recent findings that could bring hope to the estimated 35 million people world-wide who live with HIV. 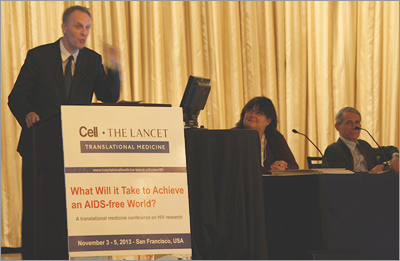 Delegates from six continents converged in San Francisco to bridge the gap between researchers and clinicians in a joint effort to identify what needs to be done before an AIDS-free world can go from dream to reality. There are, to date, only a small handful of patients who have been successfully cured of HIV; Timothy Ray Brown, also known as the "Berlin Patient," was the first. Addressing delegates at the Meeting the Speakers dinner on November 4, he reflected on the trials, tribulations and triumphs of his journey toward being cured of HIV. I am the first person in the world to be cured of HIV, but I know in my heart I'm not the last," Brown said. He went on to announce the Timothy Ray Brown Foundation's Cure Coalition and Cure Report — a new collaboration to bring various groups together in an effort to find and report on a scalable cure for HIV. "People around the world tell me my story is about hope," he said. "This hope can translate to a cure." 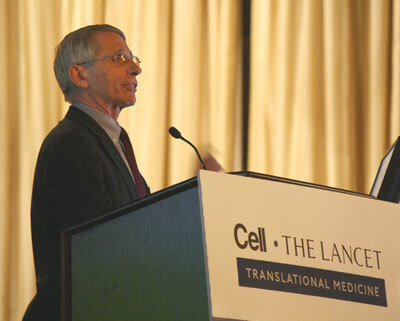 Keynote speaker Dr. Anthony Fauci, Director of the National Institute of Allergy and Infectious Diseases at the National Institutes of Health in the US, began the meeting by suggesting that for a cure to work, it must be safe, simple and scalable. Dr. Fauci discussed the feasibility of an AIDS-free world on the basis of scientific advances in preventing infections in those not infected and preventing illness in those who are infected. Preventive strategies include the expansion of HIV testing, circumcision, treatment as prevention, and prevention of mother-to-child transmission, among many others. "Biomedical interventions need to meld with human behavior and social determinants to achieve an AIDS-free world," he said. Before speakers examined the advances in these biomedical interventions, a number of researchers spoke of one of the largest roadblocks to a cure: the latent reservoir. The latent reservoir in HIV-infected patients consists of viral DNA that inserts itself into the genome of infected patients' cells without replicating. Meeting co-organizer Dr. Robert Siliciano of Johns Hopkins University recently published a paper in Cell that found the size of the latent reservoir might be 60 times larger than previously thought. Dr. Warner Greene, Director of Virology and Immunology Research at the Gladstone Institutes, discussed studies that for the first time mechanistically link the two pathogenic signatures of HIV infection: CD4 T cell depletion and chronic inflammation. These discoveries could lead to three promising outcomes — an affordable bridge therapy for the 16 million who currently need but don't have access to antiretroviral therapies (ART), a potential solution for those on ART and who are developing aging-related diseases a decade or more before the non-HIV infected population, and a potential clearing of the latent reservoir that could contribute to a cure for HIV/AIDS. Perhaps the most widely discussed option for a cure has been the hope of a vaccine. A number of speakers discussed the various advances, and also setbacks, in the race toward successful vaccination strategies. Nobel Prize winner Dr. David Baltimore of the California Institute of Technology noted, "We need a vaccine, but we still don't have an open road in front of us." The key, he said, is to not follow models of traditional vaccines but rather to "think about the extremely exciting observations that have been made about the kinds of antibodies that patients make in response to a long-term HIV infection." Speakers examined the various promising avenues toward developing an effective vaccine, including very recent work from Michel Nussenzweig and Dennis Burton on producing monoclonal broadly neutralizing antibodies in macaques. Other researchers at the meeting examined how ART can be used for primary and secondary HIV prevention. Dr. Wafaa El-Sadr of Columbia University stressed the importance of developing roadmaps for scale-up of ART therapy in diverse settings. "Working diligently on developing and evaluating tailored roadmaps for expansion of ART is critical to achieving optimal outcomes for both PLWH and for prevention," said Dr. El Sadr. She emphasized the importance of recognizing the value of the science of implementation and of scale-up. Giving equal weight to implementation and scale-up alongside the science of discovery was another important point emphasized by the panelists in this discussion. Many HIV patients have been living with the disease for decades, and as these patients age, they are faced with a new set of problems. 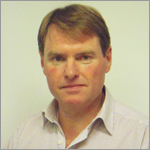 Dr. Steven G. Deeks of the University of California, San Francisco, explained that for long-term HIV patients, "despite unquestioned success, the risk of developing many morbidities remains higher than expected." HIV patients have a 1.5- to 2-fold increased risk of developing morbidities such as cancer, cardiovascular disease and liver disease, compared with the general population. Understanding the link between HIV, treatment and aging will be needed to ensure healthy old age in ART-treated persons with HIV. Members of the audience who are living with HIV noted that mental health concerns should also be prioritized for research and support in the community. Panel: What will it take to eliminate AIDS? The meeting concluded with a distinguished panel of researchers, clinicians, policy makers, and advocates broadly addressing the meeting's core question of what it will take to eliminate AIDS. Among the panelists was Nobel laureate Dr. Françoise Barré-Sinoussi, who said, "I'm here as a witness of 30 years of HIV science and translational research." 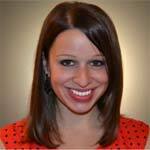 Mary Beth O'Leary (@MaryBethPress) is Press Officer and Associate Media Relations Manager for Cell Press (@CellPressNews), based in Cambridge, Massachusetts. She began her career at Cell Press as an Senior Editorial Assistant for the journal Cell before transitioning into a role as Marketing/Publicity Coordinator. In December, she moved into her position as Press Officer for Cell Press's 29 journals. A graduate of theCollege of the Holy Cross in Worcester, Massachusetts, she studied literature and art history.